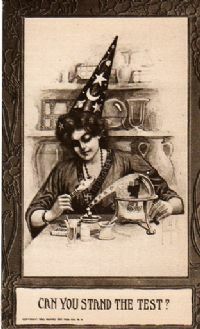 All sorts of magic , supernatural, fortune telling or occult related postcard! Here is a nice old magic related collectible! This postcard features a nice image of a magician doing a disappearing ball trick! Back is postmarked "Keyport NJ Oct 31 1938". Condition is good a shown. A nice piece!